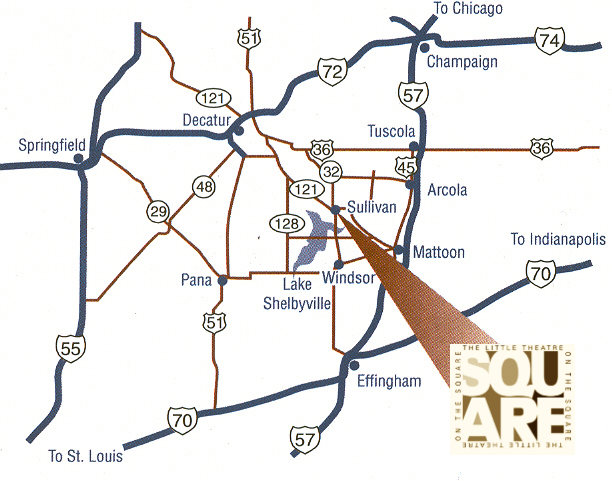 The Little Theatre On The Square is located in Central Illinois just 28 miles southeast of Decatur on Route 121, 17 miles northwest of Mattoon on Hwy 121, 35 miles north of Effingham on Route 32, and 60 miles south and west of Champaign. A visit to The Little Theatre On The Square makes for a marvelous day trip from Chicago, Indianapolis or St. Louis as well. Theatre lovers from throughout the region come to Sullivan to enjoy our productions. You can click on the interactive map below for driving directions and more.